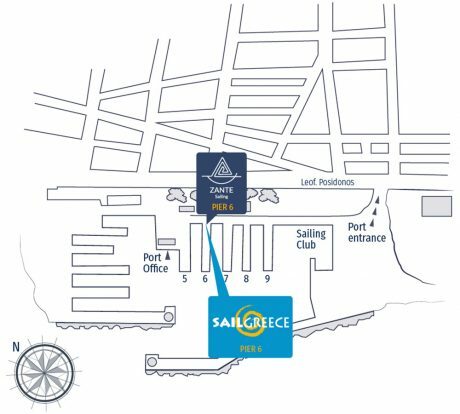 Sailgreece and Zante Sailing yachts are located together at begin of Pier 6. TAXI from Airport – approx. cost 35-40 €. We can recommend Nikos Taxi – Cost 40 € for 4 pax and 70 € for max 8 pax. For reservation please contact Joannis Makridakis in advance. BUS from Airport – X96 Bus-stop: “EDEM”. Cost 6€ – adult and 3€ – child. Travel time 45 min. Sailing (or motor boat) license for at least one member of the crew compulsory. Scan of Sailing License and Crew List with names, birth dates and passport numbers You can send earlier at info@sailgreece.pl to speed-up Coast Guard check out procedure. Kindly bear in mind that you should return the day before disembarkation by 17:00. When returning, go stern-to! Do not use anchors! Mooring lines are available. Our staff makes every effort to help you mooring safely, therefore you’d better call us 30 minutes-1 hour prior your arrival back to Marina Alimos so that you get berth-guidance. Water and offshore electricity 220V power are available on the pier without extra cost. Fuel is delivered at the pier by a fuel wagon/car at the end of every trip. There are several café-bars and restaurants in the Marina, yet when it comes to traditional Greek food at reasonable cost, we recommend “Vassilis” tavern which is situated very close to the Marina (ask our staff for directions). Also, there is a car parking are in several places around the Marina but it’s unguarded. There is no supermarket in the Marina, therefore you may either do your shopping on your own at the supermarket on the main street (Poseidonos Ave.) or you may ask us for the free of charge transfer provided by a local supermarket. The main advantage of this super market, apart from being open all day long (even if on Sundays!!!) is the transfer they provide to the super market and back to the Marina. You can also send us a provisioning list in advance so that you have everything delivered to your boat!